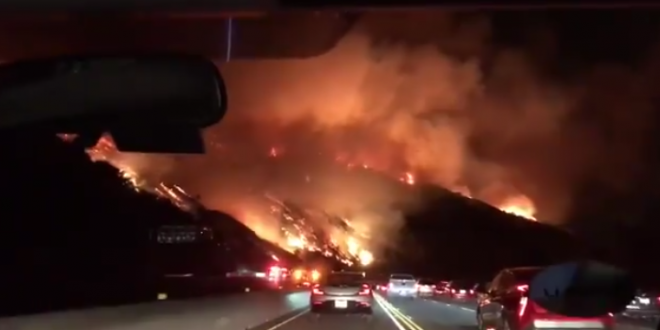 Wildfires Continue To Spread In Southern California, 50,000 Ordered To Evacuate, Highways Closed [VIDEO] - Joe.My.God. Wildfires continued to explode across Southern California on Wednesday as dry conditions and roaring winds turned the region into a tinderbox, forcing thousands to evacuate. The Thomas Fire, as the blaze has been dubbed, put approximately 50,000 residents under a mandatory evacuation and burned more than 55,000 acres in the Ventura County area with no containment after springing up earlier this week, officials said. By Wednesday morning another fire erupted farther south in Los Angeles, threatening The Getty Center, a campus of the J. Paul Getty Museum, and causing the location and surrounding roads to close, according to NBC Los Angeles. The cause of that fire is unknown at this time.